It is not my main interest because arduino coding is most fun, but still i want to see that world grow too. and see at the monitor ( at 57600 bd ) after 5 sec. 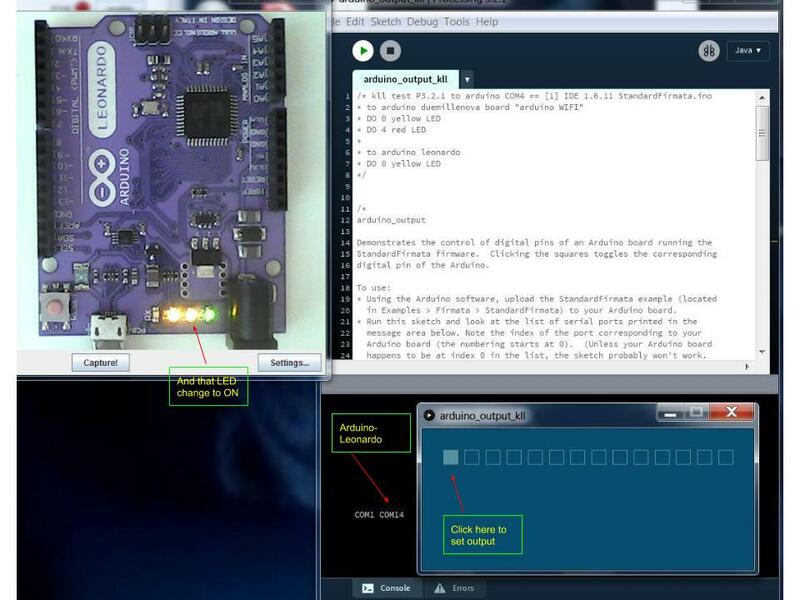 like "xxxStandardFirmata.inoxxx"
at arduino find old "Library for Processing v2.0: processing2-arduino.zip (Updated 6 Nov. 2013) "
File/preferences path .../Processing3 with file-manager check what processing copied there (at first startup)! arduino_input / _input_mega / _output / _pwm /_servo examples. after i see at Processing window down left like "COM1 COM14"
knowing my arduino use the COM14 in this case.
? you find that line ? now why the first output ?switch? is mapped to the board LED D13 i did not check, i just wanted to know if the environment works.